This is more or less a one man project with a few guests. Ryan Settee is the mastermind behind the music. This is his second High Watt Electrocutions CD. I have not heard the first one, but Jerry from Aural Innovations has spoken well of it. Anyway, the music is almost all instrumental, repetitive, dark, and moody and pretty damn interesting and cool concept album. It is available on CD and also a limited edition vinyl in only 400 copies. You get 10 pretty diverse tracks in 45 minutes. Mountains of the Pharaohs starts slow, heavy, doomy, industrial but then the pace picks up with old to snakecharming which has a very cool hard driving bass line and still this very raw, machine drumming and a mid eastern guitar line. Cool track. Slow March is still heavy and features a brief female vocal before moving into the slow Light at the Speed of Sound, which I really like, with it’s cool mood, vocal like choir, organ and a great guitar line as it gets more repetitive and spaced out. The heavy stuff comes back with Obliteration. The CD has a really nice bass sound. Still not too fond of the tiny, thin mechanical drums but musically, very cool stuff. The Hymn of the Pyramids has some very psyched out guitar and harmonica and is quite interesting and it leads into something very very different with piano and voice. That really catches you off guard for sure. This one is called Headphone Opus. A suggestion perhaps? Anyway, Ryan plays a long guitar player buried underneath all the rest of the sound. This leads into the excellent Tut will have his Revenge track with more psychy guitar work and uptempo. Evilution has a heavy guitar riff but it is balanced with a cool keyboard line and some vocals mixed quite low. The track is one of the longer ones and really develops into a monster. Stripped Ruins is an organ and harmonica piece that ends the record. Brilliant stuff. Not all that Egyptian despite the title of the record and songs but damn cool. This one man Winnipeg outfit takes stoner rock as a starting point, but from there, all bets are off. Seeking to distance himself from the more typical "verse chorus verse chorus" structure of a lot of modern rock, Ryan Electrocution instead focuses on sonic texture, hypnotic beats and rhythms, cinematic sweeps, and a good dose of very intense psychedelia. The first two cuts on the album are probably the closest High Watt Electrocutions come to what you would expect from a typical stoner rock band, but even so, there is nothing typical about these pieces. From the exquisitely beautiful harmony vocals that underpin the fuzzed out electric guitars of the chugging Mountains of the Pharoahs, to the (indeed) snakey Middle Eastern inspired guitar line that winds its way through the crunching rhythm of Ode to Snake Charming, these pieces, like everything on the album, define their own space and time, not tied to the constraints of any formula. Hence, we get the heavy but laid back trip of Light At the Speed of Sound, with druggy, chanting vocals, psychedelic guitar musings, and spacey organ, or the swirling layers of sonic soup set to a insistent beat in the decidedly out there Tut Will Have His Revenge. Some tracks are instrumental, some have vocals, but the vocals are often buried deep in the mix, ghostly voices that soothe while the rest of the song goes wild. But each piece remains focused and distinctive, taking the listener on a dark and exotic trip through strange and haunted headscapes. Particularly effective are those songs that build or divert into unpredictable directions. Headphone Opus, for example, starts with a lonely, echoing piano meditation before exploding quite suddenly into a crunching, complex and quite amazing heavy psych opus, all the while buoyed by a mesmerizing vocal riff that repeats throughout. The final two pieces on the album slide nicely into one and other for an almost 11-minute long finale. Evilution pumps along to an fascinating, fuzzed out guitar pattern before slipping gracefully into a pulsing, Floydian style atmospheric journey complete with spaced out Farfisa organ. All this drifts quite naturally into the gothic and haunting organ and harmonica interplay of Stripped Ruins. A perfect, chilled out ending to an exhilarating album. 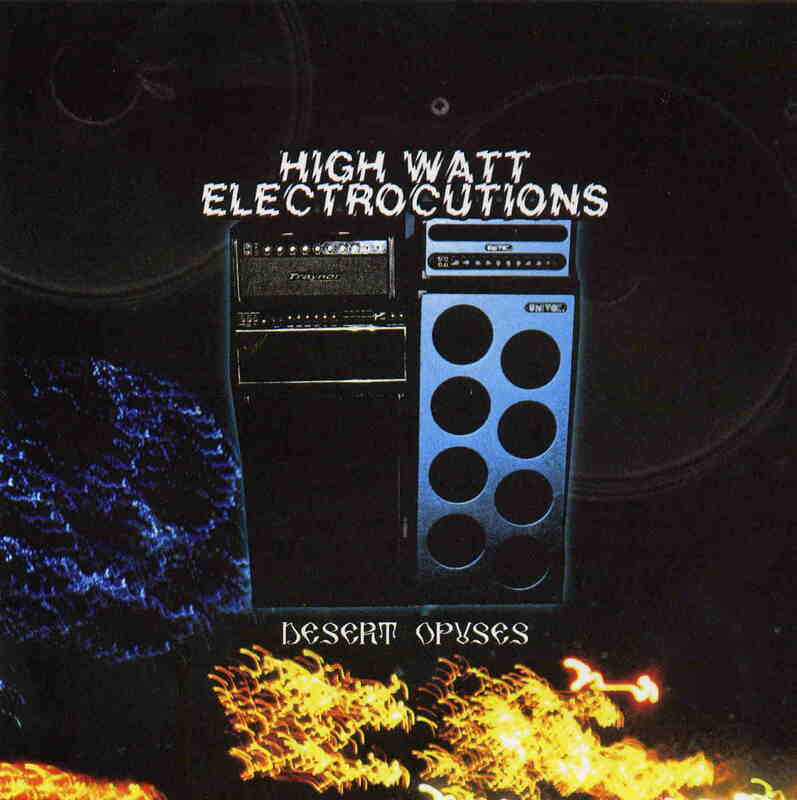 If you're looking for something electrifying, different and trippy, Desert Opuses is definitely one to check out.